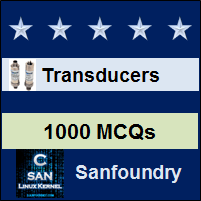 This set of Instrumentation Transducers Multiple Choice Questions & Answers (MCQs) focuses on “Ionization Transducers”. 1. Which of the following are nuclear radiations? Explanation: Beta, alpha, and gamma particles are emitted from radioactive materials and they are known as nuclear radiations. 2. Which of the following has a helium nucleus? Explanation: Alpha particles have a positive charge of 2 and relative mass of 4 which is similar to the helium nucleus. 3. Which of the following represents sensitivity of ionization transducer? Explanation: Ia is the anode current and Ig is the grid current, P is the absolute pressure of gas. 4. Which of the following potential is applied to the grid? Explanation: Grid is applied by a +ve potential of 100v in order to attract electrons. 5. Which of the following is correct for the ionization transducer? Explanation: Grid current and primary electrons are always held constant and variations in anode current are measured. 6. Cold cathode ionization vacuum gauges are more accurate than hot cathode ionization vacuum gauges. Explanation: Cold cathode vacuum gauges are less accurate than hot cathode vacuum gauges, But some difficulties in hot cathode are reduced in cold cathode type. 7. Which of the following cannot be measured using ionization transducer? Explanation: Ionization transducers can be used for measurement of displacement also. 8. Which of the following applications ionization chamber is used? Explanation: Ionization chambers in transducers are used for the detection and measurement of nuclear radiation. 9. Which of the following is a radioactive vacuum gauge? Explanation: Radioactive vacuum gauge is a cold cathode type gauge which is also based on ionization of gas. 10. Which of the following represents a mass absorption coefficient? Explanation: Ratio of linear absorption coefficient and density is known as the mass absorption coefficient.